Core Concepts in Athletic Training and Therapyprovides a balanced introduction to the knowledge, skills, and clinical abilities that span the profession of athletic training. Students in athletic training, coaching, or other health care fields will find current information covering the breadth of theory and application of athletic training, including evidence-based practice, prevention and health promotion, clinical examination and diagnosis, acute and emergency care, therapeutic interventions, and health care administration. It also presents advanced topics of pathophysiology and psychological response to sport injury to better prepare students for continued study. Compared to other introductory athletic training texts, Core Concepts in Athletic Training and Therapyis the only text that aligns with the newest athletic training education competencies from the National Athletic Trainers' Association (2011). Written by a team of respected athletic training educators with experience at the professional and collegiate levels, the text breaks new ground by condensing key concepts to a comprehensive level while not overwhelming students with content that will be addressed in depth in advanced courses. Numerous features assist students in learning the fundamentals: Each of the six parts opens with a discussion of the competencies that are covered in that part and concludes with a reference list of those competencies by description and number, making it easy to monitor the knowledge required. A companion web resource contains 41 clinical proficiency exercises, carefully chosen to complement the introductory level of the text and align with required educational objectives. The modules may be completed online or printed, and cross-references at the end of each chapter guide students to the appropriate modules to apply the chapter content. Case studies sprinkled throughout the text demonstrate real-world situations and include critical thinking questions that underscore principles of rehabilitation and exercise. Full-color photographs depict specific conditions and techniques, giving students an accurate picture of real practice. For instructors, a complete set of ancillaries assists in preparing and presenting lectures, leading class discussion, and planning assignments and assessments. In addition, Core Concepts in Athletic Training and Therapyis the first text to offer a complete chapter on evidence-based practice, the newest educational competency required of entry-level athletic trainers by the NATA. The rest of the text introduces general information about life as an athletic trainer, such as training, education, licensure, certification, employment opportunities, and the roles in a sports medicine team. The core of the text then focuses on required knowledge and skills related to injury prevention, injury recognition and classification (including region-specific examination strategies, basic objective tests, physical exam strategies, and injury mechanisms), acute care, therapeutic interventions, and the role of pharmaceuticals in the healing process. To round out the text, it addresses health care administration and discusses strategies for the management of athletic training programs. With learning features and a web resource that integrate clinical learning into an introductory course, Core Concepts in Athletic Training and Therapyis the essential resource for current and future athletic trainers. Long after its first use, it will prove a valuable reference for athletic training students as they progress through the curriculum, prepare for certificiation, and begin careers in the profession. 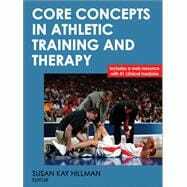 Core Concepts in Athletic Training and Therapyis part of Human Kinetics'' Athletic Training Education Series. Featuring the work of respected authorities in athletic training, this collection of outstanding textbooks, each with its own supporting instructional resources, parallels and expounds on the content areas in the accreditation standards of the NATA Education Council.